Carlos Betancourt. Process Ritual Future Eternal — Primary. Miami, FL ( November 15, 2018 ) Primary is pleased to present: "Process Ritual Future Eternal", an exhibition of new works by Carlos Betancourt. 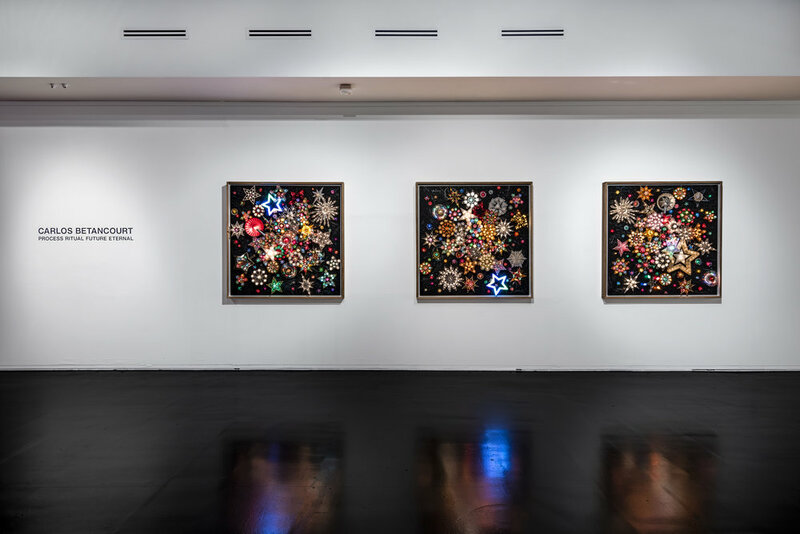 The occasion marks Betancourt's first exhibition with the gallery and his first solo exhibition in Miami in just under a decade. 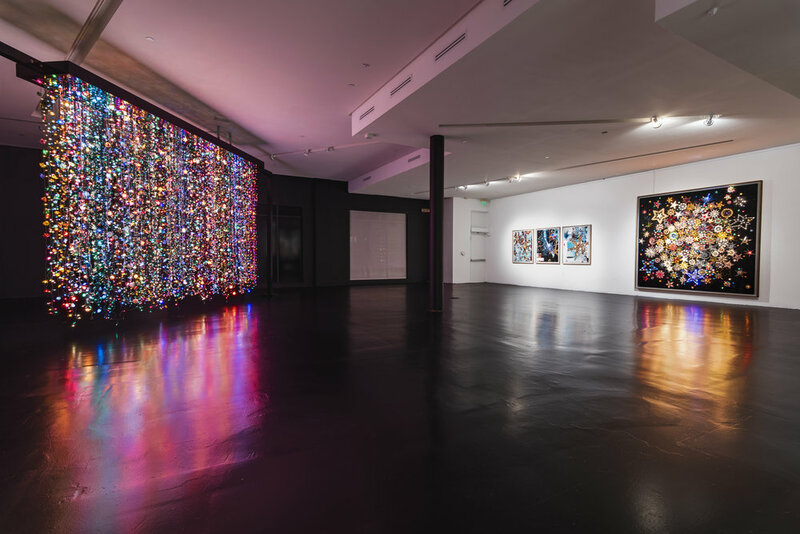 Known for his over-the-top juxtapositions of popular and domestic culture, Betancourt's work pours through Primary's expansive, low lit exhibition space with the precision of the cosmos. At a deeper look into the origin of thousands of string lights and classic holiday tree toppers, one is presented with a humbling, intimate story, and the driving force behind the exhibition. In his youth, Betancourt finds himself at a loss when he learns that a piece of his identity, symbols of celebration from his family's history, had been left to the past while settling in the United States. That singular moment triggered a life long response, collecting and protecting a broad range of precious objects discarded, the acting memories that universally engage the public across civilizations en masse. While elements of previous bodies of work remain integral, Betancourt reaches out broader than ever through electrical currents of color that collide with geometrics of aluminum and tin. The final compositions can be compared to a drug ingested on a cool crisp evening, complete with flashbacks, transporting the viewer to a familiar time and place. To struggle with this type of purity isn't uncommon but with each comforting illumination, the objects themselves celebrate Betancourt's bravery for saving them from an innocence lost, repurposing their beauty for the sake of the individual. Carlos Betancourt (b. 1966 - San Juan, Puerto Rico) Betancourt's work can be found the following permanent collections: Smithsonian' National Portrait Gallery in Washington, D.C., the Metropolitan Museum of Art in New York, Perez Art Museum Miami PAMM, Florida, NSU Art Museum Fort Lauderdale, San Antonio Museum of Art, Texas, New Orleans Museum of Art, Louisiana, Palm Springs Arts Museum, California, Bass Museum of Art, Florida, Museo de Arte Ponce, Puerto Rico, Museo de Arte Contemporaneo (MAC) in San Juan, Puerto Rico, Faena Arts District, Miami, Florida, and the Orlando Museum of Art. Betancourt is the recipient of the Florida Department of State Millennium Cultural Recognition Award, a National Endowment for the Arts Grant, and the Miami Beach Arts Council Grant and has participated as a speaker for TEDxRVA TED Talks in Richmond, Virginia. In October 2015, ''Carlos Betancourt: Imperfect Utopia'' was published by Skira/Rizzoli. Imperfect Utopia explores Betancourt's body of work with more than 250 images and text by Robert Farris Thompson, dean of the history of Art Department at Yale University, Inaugural poet Richard Blanco and writer / critic Paul Laster.